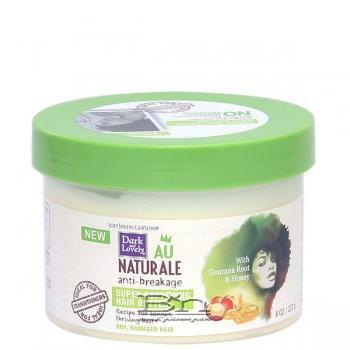 Dark and Lovely Au Naturale Anti-Breakage Super Softening Hair Butter (Dry, Damaged Hair) answers the call with a delectable, hydrating treat just for your breaking, transitioning hair. Hair feels nourished and supple without the buildup or greasy transfer. Directions: After shampooing and conditioning with Tension Release Hair Wash, Strength Restoring Conditioner, Apply a quarter size amount of Super Softening Hair Butter to damp or dry hair. Do not rinse. Use daily or as often needed.